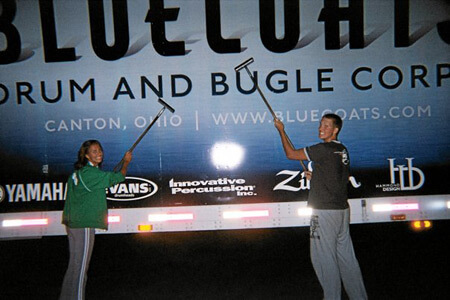 Stanciu, a 2007 member of Santa Clara Vanguard, submitted this photo and caption. My name is Stanciu and 2007 was my 10th year as a member of a drum corps, but my first and last with the Santa Clara Vanguard. While off the bus at a rest stop this past summer, my friend Ryan and I all of a sudden saw the Bluecoats' equipment truck pull up. We decided to help out and clean their truck, but little did we know that in the next few shows the corps's performances started getting cleaner and they started beating us at shows! Well, that was the last time the Vanguard ever helped clean the Bluecoats in any way. Just kidding, but it's definitely the funniest picture I took all summer!